C4FM/FM 50W 144/430MHz Digital AMS Transceiver. latest advanced features YAESU offers for the System Fusion II platform. consistent communications - even in noisy environments. Wider Receiver Coverage: 108 – 579.995MHz (108 – 137MHz: Air Band). scan and Dual Watch and so on. 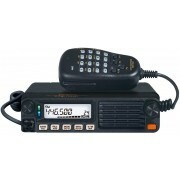 Yaesu FTM-100DR 144/430MHz Dual Band Digital Transceiver.